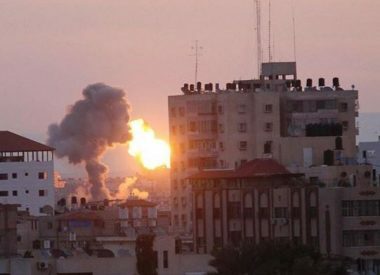 Israeli soldiers fired, on Wednesday at dawn, at least two artillery shells into Palestinian lands, close to the border fence east of Khuza’a town, east of Khan Younis, in the southern part of the Gaza Strip, wounding five Palestinians, including one who suffered a serious injury. Media sources said the soldiers, stationed across the border fence east of Khuza’a town, fired at least two shells at Palestinians who approached the border fence, wounding five; one seriously. They added that the soldiers also fired several live rounds at Red Crescent ambulances and medics who rushed to the scene. On Tuesday evening, the soldiers shot and injured five Palestinians, including one child, during a nonviolent procession near the border fence. The army also fired artillery shells into a site, east of the al-Boreij refugee camp, in central Gaza.